How emotions influence how we see the world. Cognition as a discipline has emerged over the last sixty years with the brain as a computer metaphor, leaving the study of emotion to behavioral psychology. But recent research has determined that our cognitive processing has an emotional element, and is paramount for effective functioning. Our thinking and decision making is influenced by two distinct, yet interwoven processes. One involves conscious deliberation and analysis through the prefrontal cortex where facts are considered and weighed, options generated and compared with reasoning to determine an outcome. The second system is non-conscious rapid emoto-based pattern recognition with emotionally weighted biases. Emotion triggers memories, and perceptions, and memories also trigger emotions which define the nature of our existence relative to the past and future, and our sense of power over any situation. Emotions are part of our fundamental irrationality and unpredictability and thus an important influence in creativity and original thinking. Our basic emotions come from inner extra-rational dynamics deep within our psych that are expressed as feelings, dreams, fantasies, and other imagined aspects of our lives. Our more complex emotions like loyalty, sympathy, pride, confidence, achievement, embarrassment, indignation, bewilderment, pity, elation, satisfaction, boredom, shame, disgust, frustration, and surprise, etc, tend to be socially related and constructed. Everything we perceive evokes some form of feeling and the process of creativity, innovation and invention is always an emotional and even sensual experience in people as concepts are translated into words, numbers, diagrams, or objects, leading to something inspirational. Emotions decide what we like, dislike, what is agreeable, disagreeable, giving meaning to our world. Emotions can sometimes help us see similar patterns across fields without conscious deliberation and plays an important role in signaling preferences for opportunities by arousing positive emotions, kindling enthusiasm and determining our reactions to shocks and the behavioral trajectories we take. Our level of awareness is related to various groups of emotions that may influence our perception and thought processes, and thus organization of information. Emotions play a major part in developing our self concept “I” and “me” with different sets of emotions are related to different levels of awareness. At our primal level we are concerned about our basic physiological needs. Our awareness is physical and immediate, concerned about now. Associated with our primal self are the basic emotions concerned about survival, physical fulfillment and enjoyment. The material level is concerned with pleasure, comfort, and the avoidance of pain. The boundaries of a person are metaphorically extended by the things we own. The social self is very much based in feelings of one’s position in relation to others. Empathy exists at this level and our emotions are concerned with belongingness. The ego self is the most common domain where we are concerned about ‘how we see ourselves’ and ‘how others see us’. The ego self is about glorifying ourselves. This level of awareness leads to very sophisticated coping mechanisms to deal with realities that don’t fit in with our world view. The spiritual self enables us to attach different sets of values to “I’ and “me”, where people begin to feel integrated with the world around them. At this level self esteem comes from doing what a person feels is right, and where a person may be willing to sacrifice their interests for the interests of something greater than themselves. At this higher level people can transcend their basic emotions of excitement, fear, anger, and anxiety, and will be aware of their defense mechanisms that operate at the ego level. One is immersed within their own sea of emotional orientation with each level of awareness differently influencing perception and thought. Within the lower continuums people’s streams of thought tend to be negatively based where fear manifests itself in worry, anger, judgment, and general anxiety, leading to generally pessimistic narrative. At the spiritual level there is little negative narrative on the part of the person. Our view of the world is filtered through emotions which guides our self awareness to a past or future orientation. Our thinking is swayed by our time orientation within an emotion matrix depicted in figure 1. Any past orientation will be full of stories which influence our sense of meaning about the present. Some of the stories we remember will be full of regret for past mistakes, disappointment for what was not done, or full of satisfaction and/or pride for what was achieved. The past influences our interpretation of the present. Positive and negative experiences influence what we perceive, contemplate and put our focus upon in the now. The positive and negative memories of the past also guide our direction in the future. Positive memories guide us towards action where we have a high sense of self efficacy and negative memories tend to make us averse to taking action where we have a low sense of self efficacy. The future represents our positive hopes and aspirations, or negative fears and anxieties where positive emotions may lead to a sense of high self efficacy and become powerful motivators for action, while negative emotions may lead to sense of low self efficacy feasibility and take an averse attitude towards action. Extreme feelings of low or high self efficacy can lead to either reckless overconfidence in a positive emotional state or an aversion from action out of fear and anxiety in a negative emotional state. The same feelings are not uniform across the all activities, where a person may feel a high sense of self efficacy in some areas and low sense of self efficacy in other areas. There is a strong nexus between our experiences, prior knowledge and emotion. We see the world through the perspective of our own identity shaped by our emotions. The interaction of experience, prior knowledge and emotion leads to the formation of our beliefs, which lay the foundation of our values and aspirations, expressed through patterning, and sets of heuristics which guide our thinking and decision making. The above dynamics fuels our imagination which translates our memory, into beliefs, aspirations, and emotions into scenarios that create feelings of self efficacy, motivation, energy, and drive. Our optimal position for learning is within the present orientation where the influence of future fears and hopes, past disappointments and successes are minimized and within our conscious awareness. Too much past or future orientation may lead to personal delusion such as unrealistic hopes that an entrepreneurial opportunity really exists, or massive overconfidence in one’s ability to successfully implement a complex strategy in the field. Alternatively too much future or past orientation may lead to undue pessimism where the feeling of self efficacy and motivation is low, leading to states of anxiety and inaction. 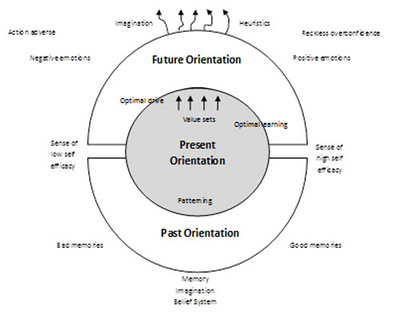 Orientation in the past will anchor one into previous patterns of success, which promote rigidity, while too much orientation into the future may lead to fantasy, thus leading to unrealistic objectives and the ability to consider realistic scenarios. The impact of our past and future orientation and sense of self efficacy upon our behavior is strong. Emotion is embedded within our culture and forms part of our domicile outlook. Philip Zimbardo postulated that people living in tropical climates where there is little change in the weather and where a language has no future tense leads to an inept propensity for action. Rural youth unemployment within developing and post industrial societies appear to be developing a generation of youth that feels little hope about the future, while societies in countries like Malaysia where sections of the population seek to cling to the order of the past may do little to prepare for the challenges of the future. Max Weber attributed the rise of capitalism in Europe to the present and future orientated Protestant work ethic and the relative backwardness of Catholic centered Europe to the past orientation of Catholic doctrines. Our emotional orientation influences our pace of life, belief systems, aspirations and propensity for action. Geshe Tashi Tsering postulated that every feeling whether good or bad, powerful or light should be paid attention to through mindfulness that can be used as a force to protect the psych. This has two important implications. The first is to be aware of our own biases and distortive tendencies in our perception of objects. The second implication is that we protect ourselves from harmful influences and ‘emotionally’ learn. Emotions dominate our deep intrinsic abilities like attention, alertness, interpersonal abilities, creativity, propensity for action, and strategic outlook, etc., shape our view of the world, and influences our intentions, and actions. This approach in explaining behavior is probably better than previous schools of entrepreneurial thought. For example, people through history like Gandhi, Churchill, Stalin, and Hitler were dominated by their emotions of concern, compassion, destiny, legacy, ruthlessness, revenge, Machiavellianism, hate, fear, and insecurity respectively. Emotions greatly influence peoples’ sense of self efficacy which infers that thinking is heavily influenced by life experience, time and place, and the levels of awareness they are attuned to. Quirin, M., Kazen, M., & Kuhl, J., (2009), “When Nonsense Sounds Happy or Helpless: The Implicit Positive and Negative Affect test (IPANAT),” Journal of Personality and Social Psychology 97(3): 500-516. Fenton-O’Creevy, M., Soane, E., Nicholson, N., & William, P. (2011), “Thinking, Feeling and Deciding: The Influence of Emotions on the Decision Making and Performance of Traders,” Journal of Organization Behavior 32(8): 1044-1061. Chodorow, N. (1999), The Power of Feeling: Personal Meaning in Psychoanalysis, Gender, and Culture. New Haven, CT: Yale University Press. Hunter, M., (2012), Opportunity, Strategy, & Entrepreneurship: A meta-Theory, Vol. 1, New York, Nova Scientific Publishers, P. 250. Root-Bernstein, R. S., & Root-Bernstein, M. M., (2001). Sparks of Genius: The Thirteen Thinking Tools of the World’s Most Creative People. Boston, Houghton Mifflin. Many people mistake their aspirations for opportunity. For example people put their money and effort into a boutique, restaurant, or spa for the wrong reasons because they like fashion, shopping, food and cooking, or aromatherapy and massage, only to close down a few months later because there was no real opportunity. However a future orientation in imagination may be the actual position that a science fiction writer may cherish. Domicile outlook can be defined as the beliefs, attitudes and views one develops from the position they live and social status. The concept brings together factors like social status, income, location, state of employment and immigrant status. Together these factors contribute to a person’s basic beliefs, attitudes and outlook towards opportunity and their potential to exploit it. Zimbardo, 7; Boyd, J. (2009), The Time Paradox: The New Psychology of Time that Will Change your Life. New York: Simon & Schuster. Andreski, S. (ed.) (1983), Max Weber on Capitalism, Bureaucracy, and Religion. London: Allen & Unwin. Mindfulness is a state of open acceptance of one’s own perceptions and sensibilities that helps our experience of being calm, relaxed and alert state of mind and be aware of our thoughts without identifying with them Ladner, L. (2005), “Bringing Mindfulness to Your Practice,” Psychology Networker July/August: 19. Tashi Tsering, Geshe (2006), Buddhist Psychology: The Foundation of Buddhist Thought, Vol. 3. Somerville, MA: Wisdom Publications, 46. Different schools of thought have tried to answer questions like “why do some people see opportunities and other people don’t?’ These have included personality traits, propensity to take risk, entrepreneurial intentions, behavioural and cognitive approaches. Interesting presentation of the cognitive process which is not only rational but emotive. All of that was already announced by Vico in the poetic philosophy of Giambattista Vico otherwise known as the New Science. Which is to say, it is a harmful reductionism to reduce what the Greeks understood as mind and even soul to nothing else than the brain which is a material reality conceived as a computer of sort. Perhaps we need to reinvent the wheel and go back to the ancient Greek who were very much conscious of the fact that a holistic approach to man was to understand that he is made of matter, mind and spirit. Could that be the sad predicament of modern man in search of a soul, to paraphrase Carl Jung?